A Visit from the Goon Squad is a complex, intricately woven story about a record producer, Bennie Salazar, and his kleptomaniac assistant Sasha. Through various characters and situations—from New York to San Francisco to an African safari to the beauty of Naples, author Jennifer Egan masterfully provides details about the pasts of both Bennie and Sasha. These two intense characters prove layered and richly fascinating. A Visit from the Goon Squad highlights the personal challenges, the zeniths and nadirs of the music industry both by those intimately involved and those on the fringes of the business. Egan writes with impressive attention to detail and possesses the ability to craft a unique, humorous and riveting portrait of two people invested in the challenging and ever-changing music industry. 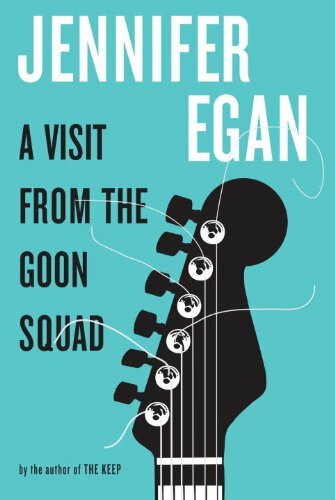 Delve into A Visit from the Goon Squad, the latest novel from a brilliant, observant author. Jennifer Egan visits Brookline Booksmith on Tuesday, June 15. Egan reads at Newtonville Books on Thursday, June 24. This entry was posted on June 6, 2010, 20:31 and is filed under Books. You can follow any responses to this entry through RSS 2.0. Both comments and pings are currently closed. Wow! A 5/5 from you — it must be a good one.